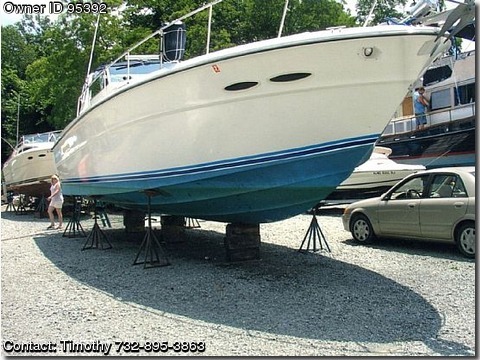 Contact the owner Timothy @ 732-895-3863 or hiwayman75(at)comcast(dot)net with any questions.This is a great chance to own a great classic Sea Ray. The fit and finish of these boats are incredible. The Caterpillar diesels with less than 600 hours on them are barely broken in, and are great on fuel. This is a nice clean boat for its age. I was very impressed with the amount of room inside for its size. You can easily use this as a live aboard or your weekend beach house. The owner is meticulous about taking care of whatever needs to be done.Boat has twin Caterpllar FWC 3208 diesel rated @ 375 Hp. with only 572 hours of total time. Canvas – Bimni with side & aft curtains & winter cover. stove, microwave & on deck ice maker. 2 State Rooms – Master has a queen berth with a in suite vanity sink &a cedar lined closet & a tv. to starboard are twin bunks. Two zone AC & Heat. Head – Head has vacuflush toilet, sink & separate shower. Head has vacuflush toilet, sink & separate shower. Dinghy – 8' Walker Bay dinghy with Cruise – N – Carry outboard.